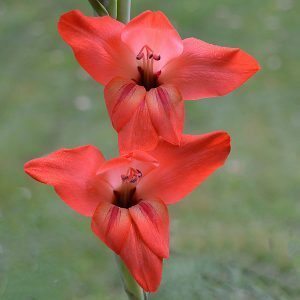 They are are easy to plant and grow, colourful and they are Gladiolus. Tall flowering bulbs that flower in summer these are a long time favourite in Australian gardens. The tall flower spikes make them great cut flowers and in the garden they do make a great display. So we commonly call them Gladi’s, Sword Lily or Gladioli, and they were made famous by our own Gladi wielding comedian Barry (Edna Everage) Humphries. These are a plant with variety, from flower form to colours, hybrids and species they are a worthwhile addition to any sunny garden. The ones we mostly see are the hybrids, however species such as Gladiolus colvillei rubra are worth seeking out. Gladiolus prefer a warm well drained sunny position. A little blood and bone, some aged cow manure and a complete fertilizer should be worked well into the soil before planting bulbs or corms. Water during the summer months but not over winter. These are plant that can reach over 1m in height and protection from strong winds is advisable. The best time to plant gladioli bulbs is from late autumn though to spring. Prepare the soil well by weeding, digging in some compost cow manure and blood and bone. Planting depth for the bulbs or corms is around 10 cm deep and 10 cm apart. Consider staking Gladioli or using a support ring. Water regularly during dry periods once signs of growth. 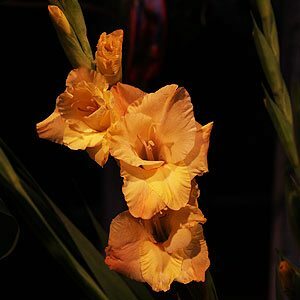 If you dig in some well rotted compost and aged animal manure (cow or sheep) then you will find that gladioli require just a little extra each year. We do use regular waterings of a liquid seaweed fertilizer as the plants begin to grow. After the season is over and we lift the corms, we usually dig in a little more compost, this seems to be enough fertilizer for our gladiolus. Water well during the growing period, a good soaking 1 – 2 times a week until the flowers have died back. 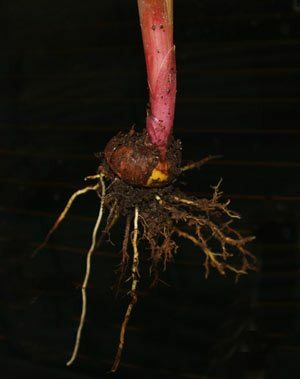 Many people lift gladiolus bulbs over winter, and for many reasons this is the right thing to do in terms of disease, bulb rot in wet periods and also flower production. However do not let this stop you, they may be left undisturbed for a few years, just top dress with a complete fertilizer after removing old foliage. If you do lift the bulbs you will need to store them properly. Make sure that the bulbs are clean and dry before storing. Place then on racks in a cool dry position with good airflow. Although they actually require little care although many gardeners will lift bulbs in autumn to winter and replant spring to prevent bulbs from rotting. This is very important in areas with wet winters and poor draining soils. Many varieties are tall growing, and with such heavy flowers can tend to fall over in windy conditions, especially if damp. Choose a spot that is protected from strong winds, and consider ‘plant hoops’ to protect blooms. Not the same great big colorful blooms that we are used to, but some very attractive flowers. Gladiolus nanus ( Queen Wilhelmina Gladiolus ), Gladiolus alatus, Gladiolus flanaganii, Gladiolus geardii, Gladiolus mureliae are a few to look for.